At Youthtopia Med Spa, we offer top of the line, medical grade only cosmeceuticals. These products are great for enhancing, maximizing and prolonging your results from our med spa treatments. Stop by Youthtopia Med Spa today to learn more and shop our great selection of products! NeoStrata professional skin care products are recommended by Dermatologists and Plastic Surgeons in over 60 countries and are the #1 recommended professional AHA skin care brand by physicians worldwide. Over time, your skin will encounter a number of factors that can leave your complexion dull, uneven, or irritated. This can manifest itself in a number of ways, including breakouts, fine lines, wrinkles, dark spots, puffy eyes, redness, and other issues. NeoStrata can help improve the overall health and appearance of your skin. These professional-strength formulas work to address a wide range of common skin issues. NeoStrata focuses on using cutting-edge ingredients to address your skin’s biggest problems, leaving you with a smooth looking and revitalized complexion. High-performing peels can help diminish the appearance of signs of aging on your face, relying on carefully selected ingredients to firm your skin. If you suffer from dull, tired-looking skin, NeoStrata products can help restore your skin’s tone and brightness. Specially designed eye products work to keep your eyes looking energized, youthful, and well-rested by reducing under eye discoloration and puffiness. NEOCUTIS is dedicated to being the most admired, trusted and innovative physician-dispensed skincare brand. NEOCUTIS strives to fulfill this mission by developing exclusive technology platforms based on cutting-edge scientific research. Incorporating targeted technologies into luxurious product formulas enables NEOCUTIS to deliver innovative skincare solutions that address key skin care concerns, including the signs of aging, discoloration, oxidative stress, skin redness and dryness. For over 25 years, Revision Skincare has provided physicians with clinically proven, high-performing skin care products. Using only the purest, most efficacious ingredients, the Revision Skincare collection was formulated to provide targeted solutions for enhancing skin’s appearance and reducing signs of aging. To ensure patients were able to obtain high-quality nutritional supplements, VitaMedica was founded over a decade ago. Initially, only a few basic supplements like the Multi-Vitamin & Mineral and Broad Spectrum Antioxidant were formulated. Over the years, as new research emerged, the Multi-Vitamin has been reformulated. And, other supplements were added to comprise what is now called the Wellness Products line. 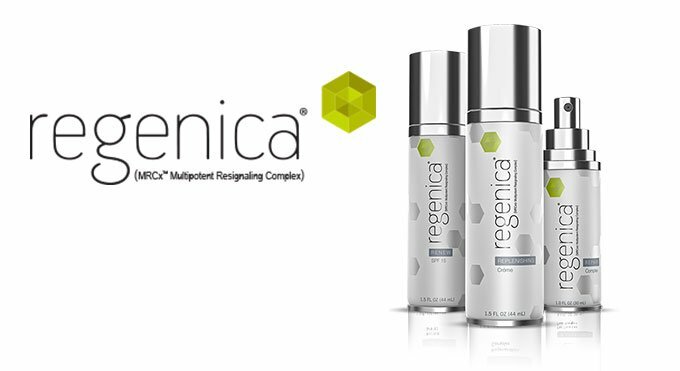 Regenica® with MRCx™ next generation growth factor technology is designed to stimulate your skin’s natural repair and renewal mechanisms.